“I think that this intolerance by gay activists toward the full spectrum of human beliefs is a sign of immaturity, juvenility….This is not the mark of a true intellectual life.” So said Camille Paglia, professor at the University of the Arts in Philadelphia, social critic, and lesbian activist. “utterly fascist and utterly Stalinist” is another way she put it. She was, of course, referring to the treatment “Duck Dynasty” star Phil Robertson has received for expressing biblical views in his now infamous GQ interview. And she is completely correct. Many fascinating events have transpired since Phil Robertson’s words ignited a maelstrom of events. There was, or course, the knee-jerk condemnation from the Left followed by the counter-condemnation from the Right. Par for the course. More interesting was Cracker Barrel removing Duck Dynasty gear, only to put it back on the shelves a few days later after observing the strength of the backlash and, I’m sure, noting that Wal-Mart was quickly selling out of Duck Dynasty merchandise. Conservative politicians praised Phil Robertson. It seemed like a repeat of Chick-fil-A founder Truett Cathy’s remarks supporting traditional marriage. But this time it is different. This time the liberal machine is starting to crack. I work in IT and deal with all manner of glitches; network glitches, server glitches, database glitches, application glitches and human glitches. IT professionals fix glitches, and I can say with 99.995% certainty that this wss not an an IT glitch. 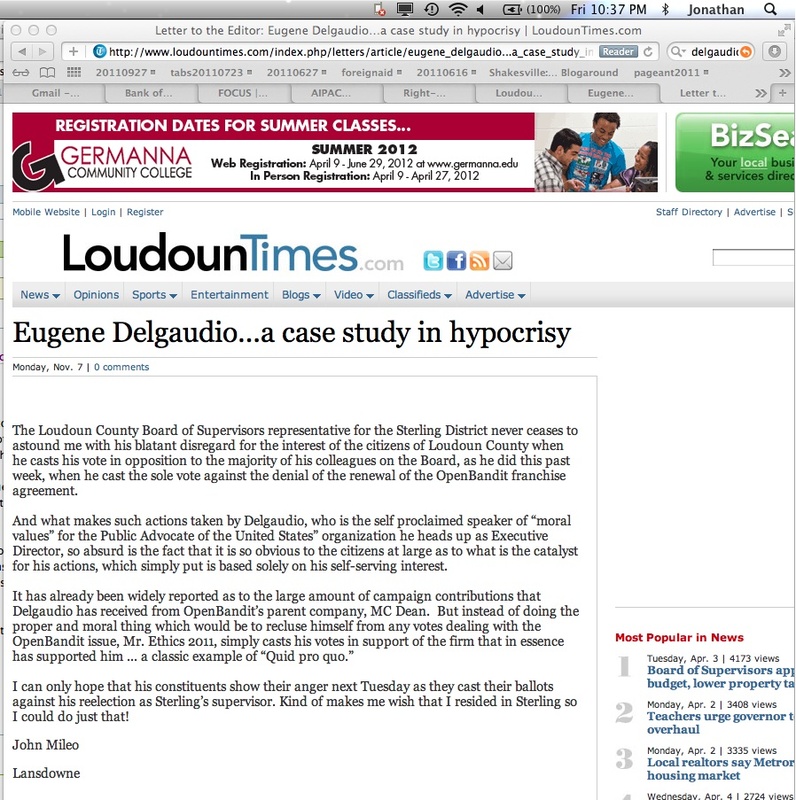 The first image is the original letter to the editor of the Loudoun Times Mirror from John Mileo, a conservative who now serves on the Courthouse grounds committee. 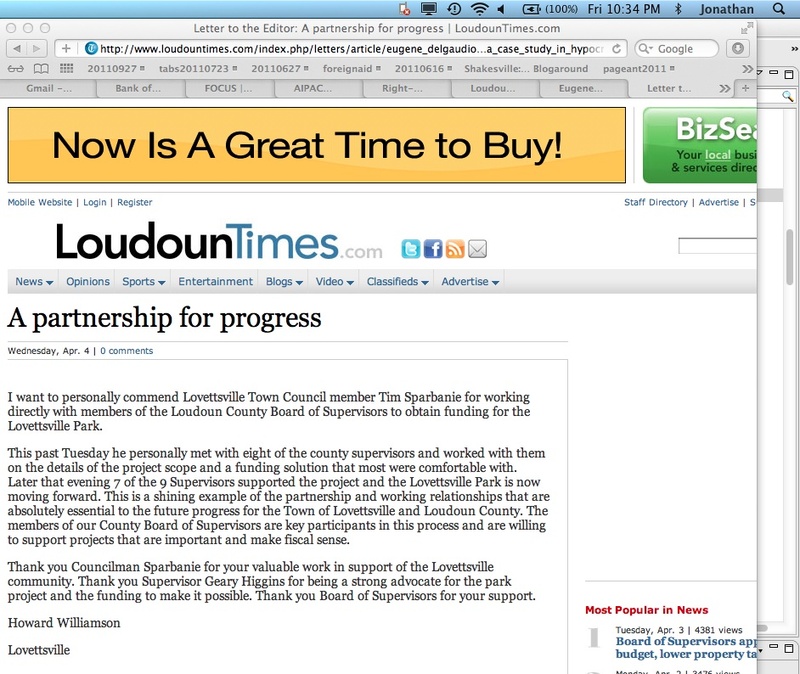 The second is the the content after the Loudoun Times Mirror site was “fixed”. The link was apparently altered in response to the comment exchange below. My browser contained the content before and after the alteration in two different tabs. You can see the URL fragments and the timestamp in the images. If you thought that you could trust the press to preserve history, you may want to rethink. Who asked for the alteration and who approved it? More will follow. The SPLC and the journalists have done a very careful job. 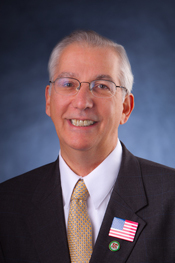 Remember that the LTM endorsed Supervisor Delgaudio and MC Dean is a large donor. Even conservative citizens see the fraud. For example, see John Mileo’s letter below. The Supervisor’s words speak for themselves. The journalists reported his own words. Although the honorable Eugene Delgaudio claims that his day and supervisor jobs are separate, the last two times this paper reported on his political gaffs; blood door, and calling people ‘it’, he was representing the Supervisor/candidate, not the hate group. ok, got it…Loudouners aren’t necessarily bigots and homophobes, just “the thick and the dim”. It must be difficult living among a vast majority of Neanderthals who cling to such outdated values. They hate gays. They hate women. They hate atheists. They hate minorities. They hate the elderly. They hate puppies. Thank God we have the SPLC to keep it all straight for us. America was once called the land of the free, home of the brave, but we have been transported to Eugenica, Eugene Delgaudio’s America. In Eugenica, the citizens support Eugene and defend everything their glorious leader says or does. Eugenica is pure. Teh gays have not penetrated the worldview force field. The throbbing throngs of homosexuals have not entered the gates. The liberals have failed to shove their agendas down the throats of the Eugenicans. Everybody wears a large Eugenican flag pin for identification, and they have a million supporters across the universe who send money when there is trouble, like when somebody from the outside world tries to “tell them what to think“. The Eugenicans are a hard-working lot. They don’t need government for nothing because government can’t do anything right. They all carry guns and drive around in Eugenican-made trucks with “Border Patrol” bumper stickers to keep the riffraff out. The scariest thing I’ve ever seen! This just arrived in my inbox. Remember *all* the controversies we’ve had over “land grabs/communist takings (except for Crooked Run)”, school plays, books, christmas displays, storm water, zoning and God knows what else? Remember that in every case, people have protested and complained in public comment and letters to the editor that they were being abused and “persecuted” by government or this or that agenda? Well, it turns out that the “real problem” is that the complainers have been too silent, so they need to stand up and make even more noise. Would it be rude of me to urge them to go for it? That doesn’t make it any less scary. What do you think? Today we face a culture in crisis. The Spiral of Silence has a stranglehold on our culture, spinning a web of lies that threaten to destroy the very fabric of society. A handful of angry voices seem to control the message on the most fundamental issues of life, liberty, marriage and family. Christians feel threatened, alone, and helpless. But you are not alone. The Spiral of Silence is fragile, and if one by one we stand up and speak out against the lie, against injustice, against evil, the spiral will begin to unravel, and truth and justice will prevail. Join us as we develop a national network of Christians who will step up and engage their communities on the key issues of life, marriage, and religious liberty. Our goals? Get committed Christians registered to vote, educated in the Biblical worldview, and mobilized to vote accordingly. Promote voter registration, Biblical worldview education, and voting biblical values with materials and technology provided by Champion the Vote. Engage your community on the issues of life, marriage, and religious liberty with resources and action plans provided by partner organizations. For more information and a link to hear a very important conference call with Chuck Colson, please visit www.breakingthespiralofsilence.com or call us at 877-547-4847. It’s nearly March and I haven’t spoken to the new BoS. Public speaking used to be easy. Any time I wanted to talk, I’d leave work, show up, and speak. Now it’s not so easy. For the first comment, I followed my usual schedule and arrived as the last speaker finished. Chairman York gaveled the meeting and I was deflated. The second time, I landed at a public hearing, not a public comment, and the next time, and the next… the comment period was too early to even try. But I’m determined. I signed up to speak twice this week. The new speaking sign-up process is interesting. I used to call in and say, “I’m going to talk about the budget” and the aide would say ok. The aide transferred me to Ilene Mallory. I’d like to sign up for public comment. The Reform Commission. It’s a Reform Commission public hearing. Do you have anything specific you’d like to address. Yes, I’d like to address the Reform Commission. You will have three minutes. Both aides asked me to explain myself, and this is coming from a BoS that is “reforming government” to make sure that their clients don’t have to jump through hoops. I’d like to know who their clients are, because they sure are not me. Why do we have to show our public comment to the aides? They are counting. That’s why. Before the war on women continues down the path recently begun by Virginia’s Republican men and a Republican candidate for president, we might do well to review what life was really like for women before the Civil Rights Era and the Women’s Movement. My first memory is being told by the bank manager where I worked part-time while in college, that my male counterpart (who had barely passed high school with a D average, whereas I was the school valedictorian) deserved twice my wage per hour, because he was a man and I was a woman. No other reason needed to be given. I’m not a regular blogger; but I was honored to be invited to blog on Patch.com in the Chantilly site, which covers much of the Dulles District, plus part of Fairfax County. I’ve done two blogs so far, one on Romney’s attitudes towards the poor, and one on the need to protect Drug Court and the Public Inebriate Center project. 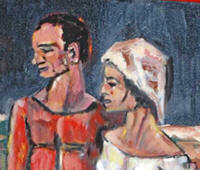 I’m also using the blog to sport my art, drawings, oil paintings, ceramics and photographs, as they relate to stories. I hope you will take the time to read the blogs and comment on the substance and the art. If there is one single message to convey to our new local government representatives it’s that the cost to refactor our land use to; 1) enable us to live within our means and 2) sustain our quality of life (gross national happiness) will be huge. Furthermore, we’re late to the starting gate and we’re running out of time. I’d love to see the BoS task the staff to develop an online Gross Local Happiness survey and to provide a database front-end and download site for reviewing the results. I’m sure there are many local statisticians who’d love to review the data. Maybe the BoS can work with the school system to survey all high-school seniors to insure that all classes income-levels are surveyed. The survey must include the address of the respondent, the year the home was built, and one or more tags that describe the home type. By the way, this piece was inspired by James A. Bacon’s, The Era of Foreclosed Possibilities. Bacon credits the Piedmont Environmental Council for sponsoring his work. No wonder the PEC is so hated. The PEC works in a reality-based world and they are guided by common sense. In just two days, Eugene Delgaudio (R-Sterling) failed “to have a positive approach with the community” (the Clarke test). He must resign. He must resign from his day job or from his Supervisor position. The two are incompatible. As Clarke puts it “I don’t think that people who hold themselves contrary to that position should be allowed to serve“. We agree. Now show us that you mean it. And round and round we go, only this time Delgaudio plays the role of both the corrupt politician and his own deflector/defender. Geary Higgins, Ken Reid, Eugene Delgaudio and Shawn Williams voted with Clarke. Scott York, Ralph Buona, Matt Letourneau and Suzanne Volpe abstained. Clarke was upset by Mackey’s “heated exchange” with the Purcellville Town Council. Mackey blogged about the issue. 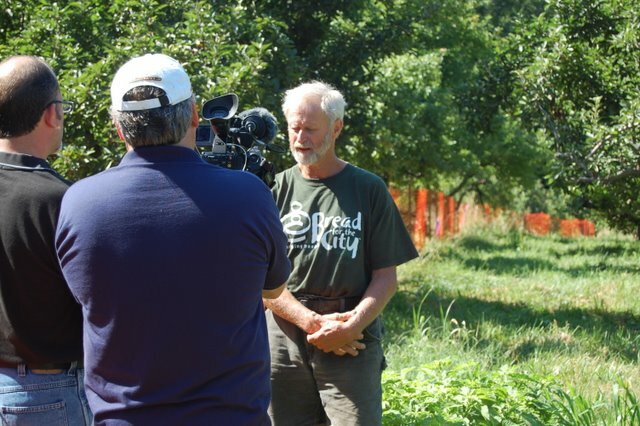 I am writing to inform you of our alliance with Sam and Uta Brown, owners of Crooked Run Orchard in their efforts to preserve their farm. For some time now, we have followed with mounting disappointment and ire the news reports of their ongoing battle with the Town of Purcellville. Perhaps, like many others in the community, we held high hopes the issue would somehow “sort itself out” and that the Browns would prevail in their campaign. 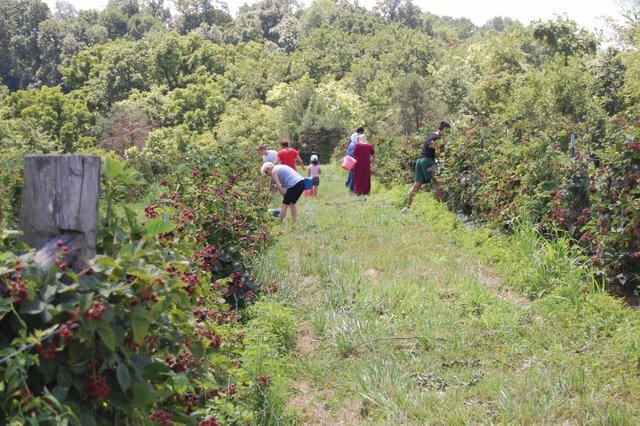 And perhaps, like many others in the community, we also held high hopes that their rights as citizens, rural business owners, and landowners would be preserved. We reacted with shock as we learned of the Town’s aggressive tactics in removing the injunction preventing the seizure of the Brown’s property, and your subsequent acquisition of their land. In our opinion, you have violated a sacred American right, and we find it unconscionable that the Town of Purcellville has engaged in such actions. Given the negative actions of the town – bisecting a thriving farm with a road – most would see Mackey’s response as a positive approach. But we are dealing with elite Loudoun Republicans who have consistently aligned themselves with so-called “property rights” activists, activists who, aside from Joe Lafiandra, ignored, and perhaps even celebrated the Purcellville land grab. Let’s add some perspective. Judeo-Christian scripture confirms, over and over, that opposition to injustice and hypocrisy is positive. But let’s turn the other cheek and give Ms Clarke her litmus test. Like Ms Clarke, we’ll ignore Mackey’s credentials; Board of the Virginia Wine Council, President of the Loudoun Wineries Association, Co-Founder, CEO and President of Notaviva Vinyards and focus on the one item she deems important. For the next four years, we expect a “positive approach with the community” from all members of our local government and their appointees. If there is a deviation, the guilty party should not be “allowed to serve“. If you witness such a deviation, post a comment and be sure to let Janet Clarke know.